In a draft bill released on 13 November, the Spanish government is proposing to ban fossil fuel subsidies and fracking, reduce greenhouse gas emissions by 20% by 2030 (37% compared to current levels) and 90% by 2050, boost the share of renewables to 35% (70% of power generation) in 2030 and discourage diesel and petrol cars. Natalie Sauer of Climate Home News portrays the woman behind the plan, ecological transition minister Teresa Ribera, and analyses what the chances are that she will succeed in her climate ambitions. Courtesy Climate Home News (CHN). In recent years, Spain has been a graveyard for climate-friendly policies. But there are signs the dead may be twitching back to life. Sworn in on 2 June with a razor-thin majority, one of the first actions of prime minister Pedro Sanchez was to create a ministry for the ecological transition. The purpose of the new office was dual: at a symbolic level, it put climate at the forefront of the national agenda; at a functional one, it called time on years of tensions between the energy and environment ministries that had crippled climate action by bringing them together. Also, for the first time in history, a woman was appointed to oversee the country’s energy policy. Teresa Ribera, a former Spanish environment secretary of state, is a fixture of the global green scene. She has been involved in global negotiations on climate change for nearly two decades and left her job as head of the Paris-based Institute of Sustainable Development and International Relations to take up her new role. So experienced is she that her name was put forward in 2016 as a possible contender to be executive secretary of the United Nations Framework Convention on Climate Change (UNFCCC) – the UN’s top climate job. Now she is in charge of her country’s climate agenda. The result, several Spanish environmental NGOs told Climate Home News, is a “180-degree turn” in rhetoric compared with the last eight years under Mariano Rajoy’s conservative government. This is all the more pressing in light of Spain’s unique vulnerability. The country is one of the most exposed in Europe, with a 2016 report predicting the south would turn to desert unless global warming was held to 1.5C. Ahead of the plan’s release, Ribera told CHN, that listed companies and financial institutions will have a duty to report their carbon footprint. The legislation also aims to carry out the energy transition in a way that doesn’t hurt workers and communities reliant on fossil fuels: “So that no one is left behind,” she said. Ribera has already scored big on that front. In October, the government struck a deal with mining unions to close down most of the country’s coal mines by the end of the year. Overall, €220m will be injected into mining regions over the next decade, boosting retirement schemes and retraining. The deal was “applauded by the international community”, Ribera said. Co-leader of the UK Green Party Jonathan Bartley tweeted at the time that the measure showed “we can move away from fossil fuels, protect jobs & restore the natural world”. Ribera also scrapped the so-called “sun tax” – an unpopular levy on solar power affecting individuals and small businesses – in early October. Ribera slammed the tax as a “great absurdity” and underlined that “a country so rich in sunlight has only 1,000 installations of this kind compared with more than one million in Germany”. “We’re hopeful,” said Sergio de Otto, president of the Fundación Renovables (Renewables Foundation). He said Ribera was talented, capable and had a strong grasp of policy. “There is a fundamental change, as the previous energy minister [Álvaro Nadal] obsessively opposed renewables,” he said. 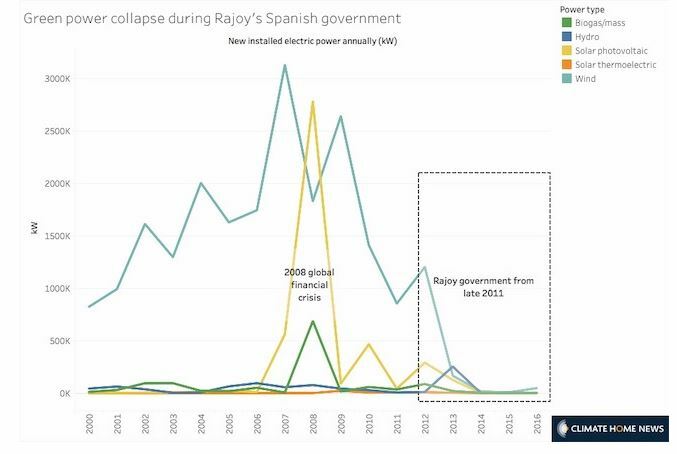 In addition to taxing solar installations, Rajoy and Nadal’s People’s Party government changed the source of renewable subsidies from an electricity tariff to the general budget in 2014. Companies complained that clean energy was being scapegoated for the ballooning Spain public debt. The industry fell off a cliff. In September, Ribera announced the government would install between 6,000 and 7,000MW of renewable power every year until 2030. This would raise capacity from 99,000 MW to 174,000 MW in 12 years. “What you see now is people investigating new projects. There is a cautious optimism that there will be a restart of the renewable energy sector in Spain,” de Otto said. That momentum looks set to extend beyond the country’s borders. “Spain is back and ready to lead climate action in the European Union,” Ribera told CHN. Just four days after she became minister, the country pressed for strong green energy targets at a meeting of energy ministers. Eventually the 2030 renewable goal was raised from 27 to 32% and energy efficiency from 30 to 32.5%. At the same time, she told CHN Spain would join a group of seven EU countries calling for overall emissions targets. Under Ribera, Spain will push for the EU to revise its commitment to the Paris climate agreement upwards by 2020. It will also lobby for the bloc’s 2050 strategy, a draft of which is expected in the coming months, to be “ambitious”. The pursuit of a transformative green programme may be jeopardised by the socialist government’s tenuous grip on power. Propped up by left wing movement Podemos and nationalist parties, Sanchez’s Socialist and Workers’ Party of Spain (PSOE) holds just a quarter of seats in parliament. But de Otto is cautiously optimistic. “When it comes to the energy transition, the PSOE will find a greater majority than in other areas,” he said. A recent package of energy measures, which included the cancellation of the sun tax, passed without opposition. The People’s Party, which created the levy, abstained. By removing a 7% tax on production of electricity, the government had favoured “nuclear power on the one hand and fossil fuels on the other”, she said. Pizzinato said the government must address the energy oligopoly of the “Big Five”: Endesa, Iberdrola, Gas Natural Fenosa, EDP España and Viesgo. Electricity companies have repeatedly been accused of manipulating prices in the country. Ibedrola was fined €25 million in November 2015. Contacted by CHN, Juantxo López de Uralde, a green party deputy and spokesperson for an eco-parliamentary group that includes Podemos, said Podemos and the government were working to end windfall profits in the energy sector. Another notable threat to climate action is the country’s car industry. Spain, which is the EU’s second largest car-manufacturer after Germany, has time and again been timid around targets for electric cars. There was little doubt that the influence of the car lobby was a factor in this, de Otto and Pizzinato told CHN. To Ecologists in Action, an umbrella group of local Spanish environmental associations, this explains why Teresa Ribera opted to support a 35% reduction of emissions in newly registered vehicles at EU level. Spain’s position was higher than Germany’s, which had called for 30%, but lower than the 40% voted by the European Parliament. Ribera denies her position amounted to a compromise, or that she was swayed by the car lobby. She said Spain had defended a 35% target, provided there was an intention to move above that mark during the legislative process. Ecologists, from the parliamentary benches to green businesses and NGOs, will be watching closely. “The biggest obstacle in relation to this transition is the perception that we’re not in any hurry. We can’t leave the transition to the last decade,” de Otto insists. This article was first published on Climate Home News and is republished here under a Creative Commons licence.